Where can I see a moose? Anchorage is one of the best places to see a moose. Wildlife officials estimate around 1,500 of them live wild in and around the city. 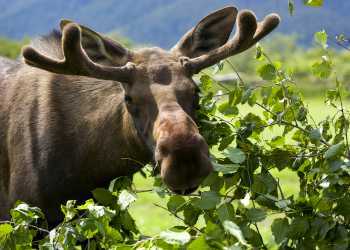 It is much more likely to find one munching through a flowerbed or nibbling backyard birch than in a remote location. Moose tend to be more active in the morning and evening hours. In summer they bed down midday to keep cool during the warmest hours. Moose are tall, so they are easy to spot. But if the biggest member of the deer family eludes you, there are a number of nearby spots for guaranteed viewing. Several moose call the Alaska Zoo and Alaska Wildlife Conservation Center home. The odds of spotting a moose are good, but for those who want to brag about seeing one on the first day, check out this guide on how to spot a moose in the first hour.